BNP Blast Cabinets offer the industry’s most preferred manual and automated blast cabinets. You’ll find these versatile, industrial-quality manual blast cabinets in job shops, automotive rebuilders, and machine shops throughout the world. 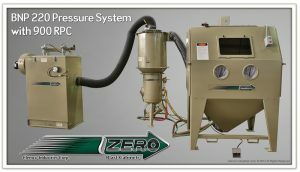 Clemco’s automated blast systems include everything from simple timer-controlled parts rotation or tumbling to computer-controlled, multi-step, multi-axis robotic action. Please contact us for more information on the numerous models and configurations available.